Florence is an art lover’s destination. From the whimsical to the contemplative, from the kinetic to the grounded, Florence abounds with public art that merits your attention. Galleries around town present art that is unique to the Oregon Coast, and inspired by our ocean, rivers, dunes, bridge, flora, and wildlife. But art is not confined just to the galleries and shops, it’s everywhere you look around town. There are numerous outdoor public art displays too. 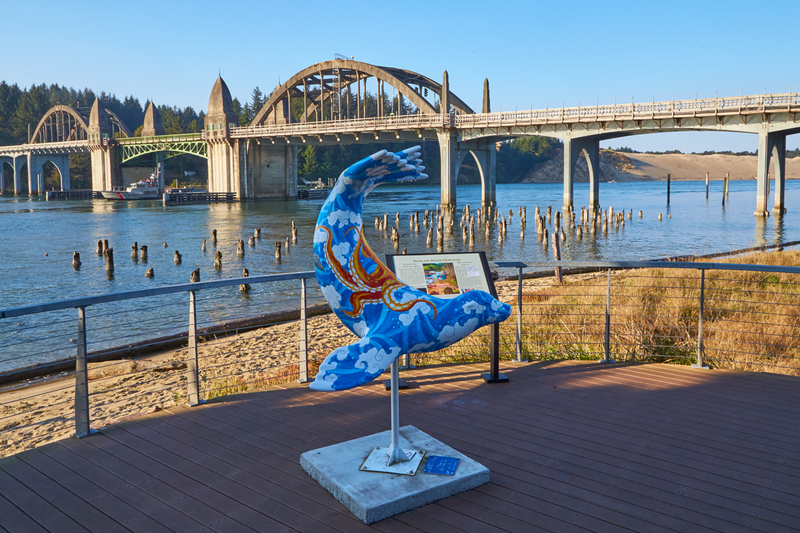 You’ll find a wild galloping horse at the Florence Senior Center, steel and copper whirligigs at Gazebo Park and the Siuslaw River Interpretive park, a dancing sea lion at the Chamber’s Visitor’s Center (and several other locations), hand-painted tiles at the boardwalk, and painted rocks left randomly all around town. Florence has many talented artists. Whether it’s painting, metalwork, wood carving, glass blowing, textiles, photography, music, or stage, the local artisanal community is overflowing with talent. In Florence, every day is a celebration of the arts. 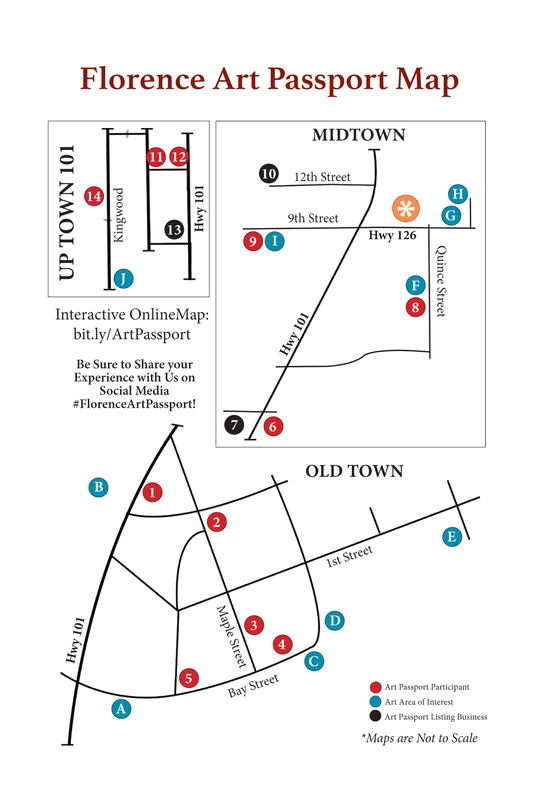 On the second Saturday of every month, Florence celebrates the arts community by visiting galleries during a self-guided tour and enjoying the variety of new pieces showcased at each location during the Second Saturday Art Walk from 3:00 to 5:00 p.m. in Historic Old Town. The rest of the time, you can guide yourself with the Florence Passport to the Arts, your guide to galleries, shops, outdoor displays, and other easy-to-access locations. 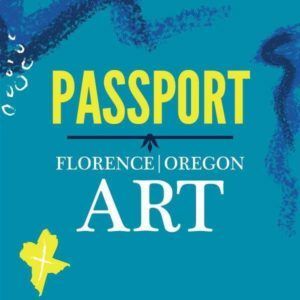 Those who obtain the Florence Passport to the Arts and complete its tour by collecting 10 stickers from participating locations will be eligible for valuable prizes. Of the 17 displays listed in the passport, there are 10 locations from which Passport holders can collect a sticker. Completed Passports can be mailed to or dropped off at The Siuslaw News, PO Box 10 Florence, OR, 97439 or 148 Maple St. 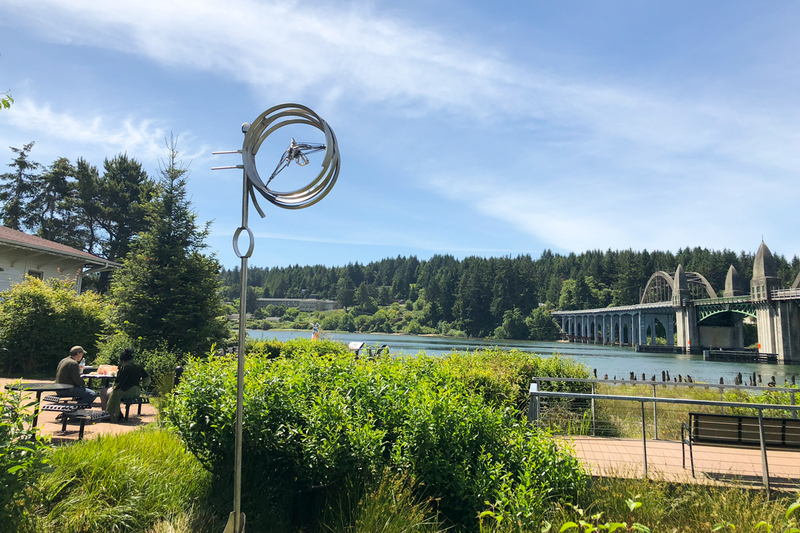 Among the galleries are three ever-changing indoor public art exhibits: one at the Chamber’s Visitors Center, 290 Highway 101; another at the Siuslaw Public Library, 1460 9th St.; and the other at the Florence Events Center, 715 Quince St.
They’ve nailed it, and continue to do so. Since mid-2017 they have completed eight projects including student involvement in painting trash cans in Old Town, installing three donated pieces of art, and placing four new sculptures. They also have two large mural projects on the drawing board which will be completed by spring/summer, 2019. Around town there are several performance venues including an art house movie theater and the 455-seat Florence Events Center with local and national caliber performances. There are also two excellent museums for regional history and military history that feature artistic displays. The arts scene also includes major improvements to the City’s infrastructure. Most significant is the ReVision Florence streetscape design project which will transform the Highway 101 corridor with public art installations, gateways, landscaping, and added sidewalks and benches. The project is slated for completion in 2019. 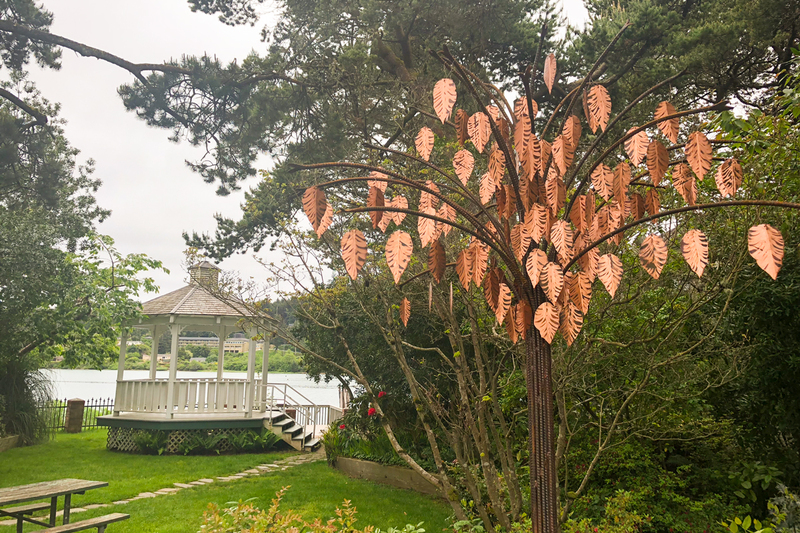 Maybe the oldest public art installation in the area is the Heceta Head Light Station. Since 1894 this 56-foot-tall working lighthouse has cast its bright beam more than 20 miles out to sea, helping many a mariner from its outpost 205 feet above the ocean. Situated on the rugged Heceta Head outcropping, just 10 scenic miles north of Florence, it is one of the most popular, inspirational, and most photographed sites on the Oregon Coast. The Heceta Head Lighthouse and Queen Ann style Light Keeper’s home (now a highly-rated bed-and-breakfast) are both are listed on the National Register of Historic Places. Seasonally, free tours are available of both.